50 Dragons would have to be one of the biggest paying Aristocrat pokies we have ever witnessed. 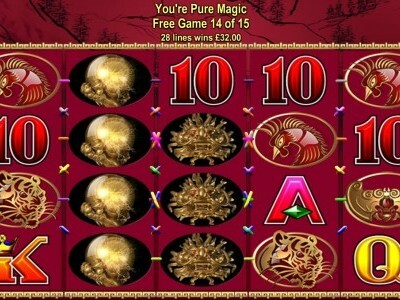 When playing this Australian pokie machine you will come across a pearl (WILD), gold ingot (SCATTER), Chicken, Tiger, Fish and Beetle symbols. This is an Asian inspired game which also includes the A, K, Q, J, 10, 9 symbols. You can pay between 1 to 50 paylines and symbols pay left to right. 3 or more of the scattered INGOTS win the 10 free spins bonus. Every free game in 50 Dragons provides an additional pearl to reels 2, 3, 4 and 5. The free spins can be re-triggered with another 5 free games up for grabs. The highest paying symbol is the golden mask which pays out a massive 1000 credits for 5 in a row. Aristocrat has done it again with yet another amazing slot!